Our Lady of Guadalupe appeared in Mexico as the pregnant Mother of God to Blessed Juan Diego, an Aztec Indian, on December 9, 10, and 12, 1531. She left a Miraculous Image of her appearance on his cactus fiber cloak, or "tilma", which still exists today for all to see in the Basilica of Our Lady of Guadalupe in Mexico City. Our Lady came to offer faith, hope and consolation to the oppressed natives of Mexico and to reconcile them with their Spanish rulers. She put an end to the bloody human sacrifice of the Aztecs and converted ten million natives in the next 10 years! After the conquest, the Spanish rule of the natives was so severe that a bloody revolt was imminent. Bishop Zummaraga prayed for Our Lady to intervene to prevent an uprising, to reconcile the Spanish and the natives and to bring peace. He asked that he would receive roses native to his homeland of Castile Spain as a sign that his prayer would be answered. On December 9, 1531, Our Lady appeared to Blessed Juan Diego who was a recently converted Aztec. She asked his to go to the Bishop and request him to build a church for her on the barren hill of Tepeyac which is now part of Mexico City. Our Lady wanted to show her merciful love to all of her children. The prudent Bishop asked Juan to ask the Lady for a sign. Juan did so and Our Lady promised to give him the sign. On December 12, Our Lady again appeared to Juan on Tepeyac Hill and told him to pick the Castilian roses which miraculously appeared there and bring them to the Bishop as a sign for him to believe her request. Juan gathered the roses into his tilma and brought them to the Bishop. He opened the tilma to show them and, to everyone's astonishment, the Image of Our Lady appeared on it. The Bishop then built the church as Our Lady had requested and ten million natives were converted and baptized to the one, true faith within the next 10 years. Human sacrifice ended in Mexico forever. Our Lady of Guadalupe, which means Crusher of the serpent's head, brought the light of the true faith, crushed the false gods of Mexico, and established an era of peace. The Image of Our Lady is actually an Aztec Pictograph which was read and understood quickly by the Aztec Indians. THE LADY STOOD IN FRONT OF THE SUN - She was greater than their dreaded sun-god "Huitzilopochtli". HER FOOT RESTED ON THE CRESCENT MOON - She had clearly vanquished their foremost deity, the feather serpent "Quetzalcoatl". THE STARS STREWN ACROSS THE MANTLE - She was greater than the stars of heaven which they worshipped. She was a virgin and the Queen of the heavens for Virgo rests over her womb and the northern crown upon her head. She appeared on December 12, 1531, for the stars that she wore are the constellation of stars that appeared in the sky that day! THE BLUEâGREEN HUE OF HER MANTLE - She was a Queen for she wears the color of royalty. THE BLACK CROSS ON THE BROOCH AT HER NECK - Her God was that of the Spanish Missionaries, Jesus Christ her son. THE BLACK BELT - She was with child for she wore the Aztec Maternity Belt. THE FOUR-PETAL FLOWER OVER THE WOMB - She was the "Mother of God." The flower was a special symbol of life, movement and deity - the center of the universe. HER HANDS ARE JOINED IN PRAYER - She was not God but clearly there was one greater than Her and she pointed her finger to the cross on her brooch. THE DESIGN ON HER ROSE-COLORED GARMENT - She is the "Queen of the Earth," for she is wearing a map of Mexico telling the Indians exactly where the apparition took place. The image to this date, cannot be explained by science. The image shows no sign of deterioration after 450 years! 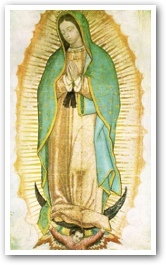 The tilma or cloak of Juan Diego on which the image of Our Lady has been imprinted, is a coarse fabric made from the threads of the maguey cactus. This fiber disintegrates within 20-60 years! There is no under-sketch, no sizing and no protective over-varnish on the image. Microscopic examination revealed that there were no brush strokes. The image seems to increase in size and change colors due to an unknown property of the surface and substance of which it is made. The image has consistently defied exact reproduction, whether by brush or camera. Several images can be seen reflected in the eyes of the Virgin. It is believed to be the images of Juan Diego, Bishop Juan de Zummaraga, Juan Gonzales, the interpreter and others. The distortion and place of the images are identical to what is produced in the normal eye which is impossible to obtain on a flat surface. The stars on Our Lady's Mantle coincide with the constellation in the sky on December 12, 1531. All who have scientifically examined the image of Our Lady over the centuries confess that its properties are absolutely unique and so inexplicable in human terms that the image can only be supernatural! Dan Lynch. "The Amazing Truth of Our Lady of Guadalupe." Catholic Exchange (December, 2002). This article reprinted with permission from Dan Lynch. Dan Lynch is the National Guardian of the Missionary Image of Our Lady of Guadalupe. The Apostolates of The Missionary Image and Jesus King of All Nations 144 Sheldon Road, St. Albans, VT 05478 Phone: 802-524-5350 - Fax: 802-524-5673. To receive his free newsletter, click here.